This is the second painting from our little getaway to “Longtown in Herefordshire”. See the description for painting 93 for more about this trip. 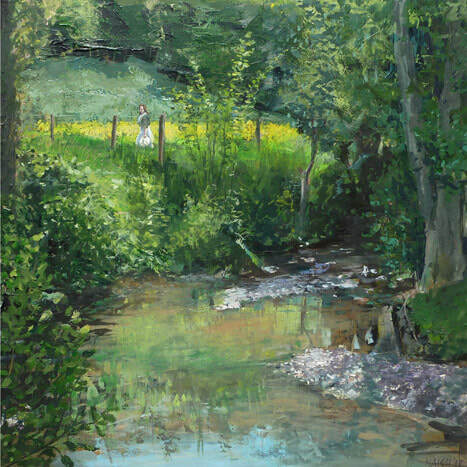 This painting was a short walk from the holiday cottage, again on private land and was partly chosen for having a park bench style seat on the banks of the river where I could set up camp. Much head scratching followed trying to capture the ever-changing scene as the sun moved around throughout the day. Luckily the May weather proved still and sunny:- astonishingly co-operative. With a couple of days or so of splattering the canvas with paint; I knew I would be returning home with an unfinished piece. Something was missing and I couldn’t quite put my finger on it. I took a series of photos of the view for reference – although I never seemed to capture the stillness of the water which had been a constant throughout the sitting. Below is a photograph of the painting before the studio sessions. Back at base, it wasn’t long before I established that I wanted a figure to add scale and point to the piece. Weirdly I had seen my wife walk along the path through the meadow (where the figure is now located) and wasn’t speedy enough to capture it in a photo. It hadn’t struck me that this was worth re-staging to gain appropriate reference. This meant a trip to the Hitchin lavender fields to recreate “Girl walking dreamily through summer meadow” after the event. The wife obliged and I managed to get enough to add the figure to the painting. I had started the studio stage of the painting with the belief that it was a figure and a more detailed approach to the water that would be all that was needed. Of course once a fairly detailed figure had been added it highlighted everything else as being a little vague. So I enhanced the detail in patches and also quite late on toned back the figure’s navy blue cardigan. There is a point where the information on display is coherent enough while the joy in the brushstrokes is still present. Hopefully this a stage that I have achieved when I put down my brushes.